How long have you been in the bike building business? Well, the business keeps changing over time. I started the shop with three other guys. One of them is still around, other people have come and gone. That was in 2006 or 2007. We got a little 300 square foot space here. Over time we’ve moved a bit and taken over space and expanded. Now we have 1,700 square feet. We’ve upgraded quite a bit since the beginning. That has also evolved over time. When I started out, I thought I was just going to build bicycle trailers. But because I worked in a bike shop and learned some TIG welding and other stuff from a professional frame builder, I knew how to work on bike frames too. I started getting frame repair and braze-on work and other things having to do with bikes. Over time the bike trailers have become a smaller part of it. As different people came in with different skills and got involved with the shop, we’ve evolved our business. Over time we’ve bought new tools and accepted new jobs and new challenges and taught ourselves as we went along. Nowadays, we do quite a variety of bicycle related stuff. It still includes building trailers, fixing broken stuff, adding braze-ons and other modifications to frames. We build racks and other add-ons for cargo bikes. And we make a couple of products such as the Rolling Jackass center stand, which is a motorcycle-style kickstand for Xtracycles and other long-tail cargo bikes. With mopeds and small motorcycles we do engine repairs and rebuilds, custom parts, modifying and fixing frames. Then we do general contract machine work. We have other shops that subcontract work to us if it’s fast turn around prototype work. We don’t have the ability to do mass production, computer controlled manufacturing the way other modern machine shops would. But we know what we’re doing and can do really fast turn around times. We get really interesting jobs for instance from a place that makes natural gas equipment and is getting huge amounts of stuff manufactured. They own a factory in China and they’re giant, but every once in a while they’re like, “oh crap we’ve gotta prototype this part and we need it this week” so they come to us. Another one of our big customers is a guy on Vashon Island who’s a farrier, he works on horse hooves. He has his own line of horse hoof care tools and we make most of the parts for those. Totally random, but it’s right up our alley because it’s small scale fabrication work that includes a lot of detail work, making things precisely, TIG welding steel, aluminum parts. It falls right into place in our shop. Colin Stevens in his shop. Photo by Josh Cohen. How did you learn to weld and fabricate in the first place? It was totally just for fun at first. A friend of mine said we should learn how to weld and he bought some cheapo welder. We just played around with it in the backyard. We made all kinds of sketchy stuff: tall bikes and choppers. Then I was unemployed for a while and started hanging out with David Wilson, who was a professional frame builder here in Seattle. I learned a lot of skills being in that shop. I learned TIG welding and brazing and how to work on bike frames in general. Then shortly after he moved away we got this shop space. There were just four of us and it was mostly an excuse to get all our tools together in one place. It was still just a hobby. I still worked in a bike shop at the time. We would just come down here and have fun. But the more we did it, the more we learned, the more work we got. Over time we’ve experimented and learned from each other and jobs and developed our skills over time. I gather that bike shop life runs in your blood. Was it your great grandfather who had a shop in New York? Great-great Grandfather. I don’t know that much about it. My grandfather–who lives in California and is an awesome guy–was doing some family research and he had some photos of his grandfather and sent them to me. 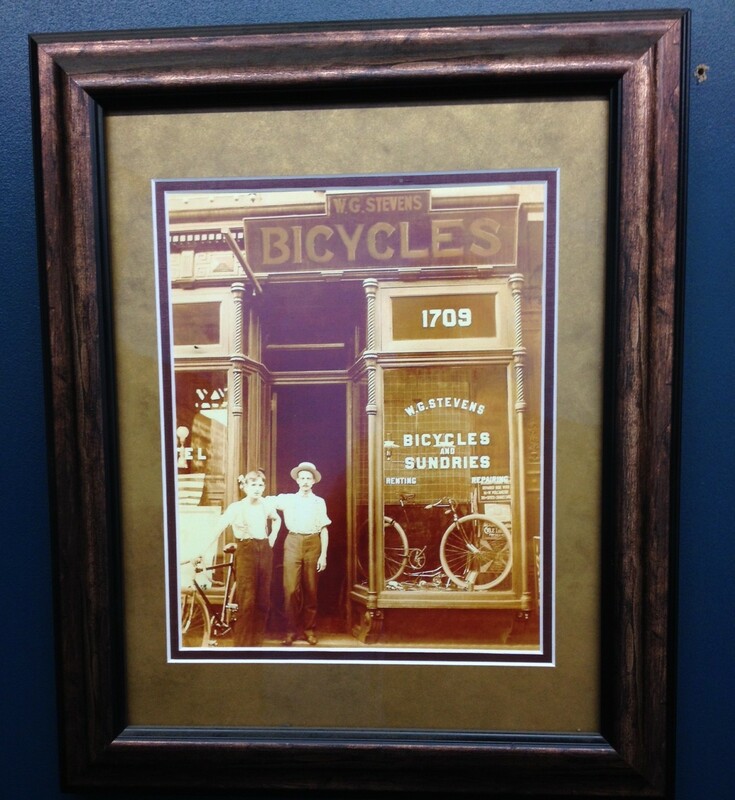 There’s a photo of my great, great grandfather in front of his bicycle shop in New York. It’s pretty cool. I think it’s coincidence that it happened. He owned a bike shop and was also a lapidary, cutting and polishing gemstones. His son also did that. My grandfather was a psychology professor at UCSD. And his son, my father, was a self-employed woodworker, so that’s much more along the lines of what I ended up doing here. Why did you start out focusing on cargo bikes and trailers and really utilitarian bikes? Because that’s what I was doing with my life. I built a trailer because I wanted one to haul building supplies. I didn’t have a car. I still don’t have a car. I thought this isn’t that hard to do on a bicycle, I want to be able to go out and buy building materials or bring my bicycle somewhere to work on them. It just made so much sense for me to have a trailer. That was when I was screwing around with the welder in the backyard, so the first bicycle trailer was born of that. Then, because it seemed like there were really limited options for that kind of bicycle trailer out there, I decided I should make a business out of it. There were all kinds of little bike trailers to haul your kids or your dog or a small amount of groceries, but there were only a couple of choices out there for large ones. Colin Steven’s great, great grandfather owned a bike shop in New York City. How did the business do? Did people buy into it? It actually went pretty well. That by itself would certainly not be enough to keep me going full time. But at the time when I was just starting out, I was either just living cheaply, or had another part time job, and was spending a lot of time designing the first few iterations of the trailer and getting off the ground. It was the perfect amount of work. I usually had a couple of orders on standby to keep me going. Now I’ve probably made at least 50 bike trailers. Cargo bikes and utilitarian city bikes definitely seem to be having a moment in the bike world right now. Do you feel like people are catching on to the practicality of bikes as city transport? Is it just good marketing by Xtracycle? Xtracycle probably has a lot to do with it. They have really come out with a lot of groundbreaking products over the years. The original FreeRadical was a really cool thing. They got a lot of people into cargo bikes. Now the Edgerunner is great. It’s interesting, when my friends and I started out doing that in 2003 or 2004, it was really rare to see any kind of cargo bikes or big bike trailers around. We were the ones doing it. We thought this is a new thing that’s going to become cool and popular in a place like Seattle where people are kind of conscious about the environment and want alternative transportation means. A big city is an ideal place to do it because most of your resources are close by. We thought it was going to be people like us who wanted to transport stuff like lumber or bicycles. What has actually happened is it’s family biking that has made cargo bikes popular. I think the vast majority of cargo bikes now are sold to parents who want to haul their kids around. That has become the driving force, which is pretty cool. I didn’t expect that, but it is great that that’s what’s made it popular. Who are your bike customers? Who are you doing custom work for and building trailers for? Nowadays the trailer sales are typically people who want something extra special and custom. Usually it’s people who are doing it as part of a business. There’s one in the shop right now waiting to get powder coated for a brewpub in California that’s going to do a mobile bar. I’ve done a couple for landscapers who want special holders to carry their tools and ladders and they carry yard waste or branches in the trailer. Most of the frame repair work is references from bike shops around the city. Now that Elliott Bay Closed up shop. R&E does a great business building bike frames and I don’t think it’s as profitable for them to repair bike frames. Their standard line when people come in for frame repairs is, “sure we can do it, but it’s going to be like four months from now.” I think we’re pretty much the only place in the city now that has fast turn around on little projects like that. The racks that I build, which are popular on a couple specific models of bikes, that is mostly Internet sales through word of mouth and message boards and email groups of people who have specialty bikes they use for gravel riding, randonneuring-style stuff. 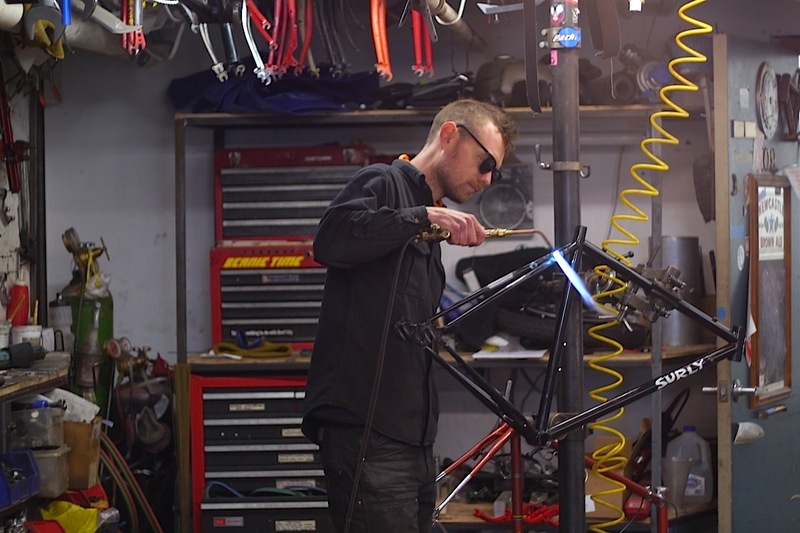 What do you think you’d be doing if you weren’t building bikes and doing metal fabrication? I have no idea. I didn’t think this is what I was going to do with my life. I came to [University of Washington] to do computer science, which would’ve lead me off in a completely different direction. I suppose I could’ve followed through with that. It was a really fun thing for me in high school and I carried it into college. It’s creative solving problems on the computer, writing computer programs. But I found the hands on creativity was much more rewarding for me and got into this instead. Is that part of what attracts you to your work? Yeah. It’s fun. I always think it’s like playing with legos when I was a kid. Except now instead of legos that only fit together in certain ways, I have metal and I can put it together however I want and build anything. Things that serve useful, real world functions. What’s the craziest thing you’ve ever built? I’ve built so many crazy things. 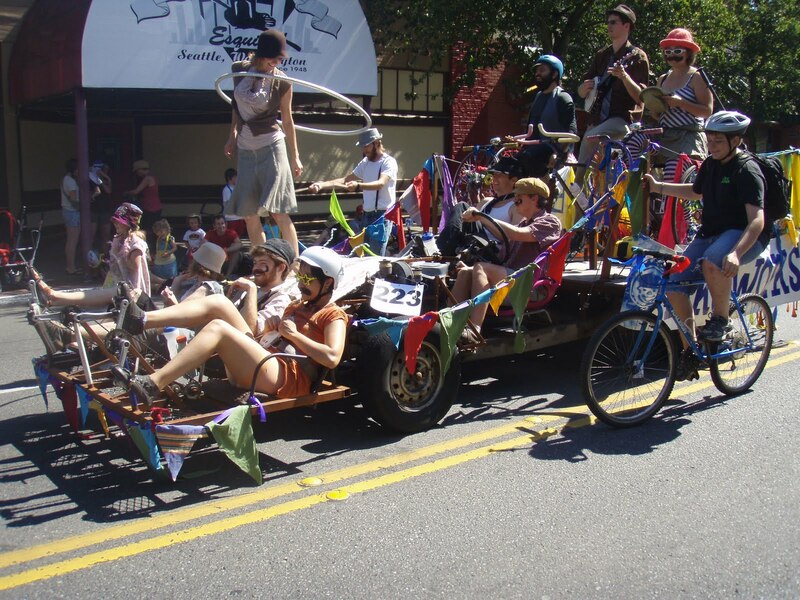 The biggest, most visible crazy thing I’ve ever built is the pedal-powered parade float. I’ve actually made two consecutive ones. The original, which didn’t work as well, eventually got scrapped. The second one is still up and running. My friend Webster on Beacon Hill owns it and it gets taken out on parades periodically. It’s an old Toyota pick up frame that’s all stripped down and set up with seven pedaling positions and a driver. It doesn’t go very fast because it’s a truck frame, but it’s pretty cool in parades. That’s a big thing that’s easy for people to see. I think a lot of things the stuff we do on a day-to-day basis, which is technical machine shop work that requires special tools and high precision and creativity is really fascinating. Even if it’s just a little tiny thing. Your business has grown really organically over time. Do you have any concrete plans to expand or are you just going to continue growing like you’ve been growing? I think it’s the latter. We definitely do expect and hope to keep growing. For the first time this year, we actually have one to two full-time employees, which is another big step. But it’s really cool to have enough work to support that and to feel like we are moving forward, buying more tools, getting more projects, paying ourselves a little bit. But no concrete plans. We’re always juggling having repetitive work or product lines that can reliably bring in money and doing the custom work that is always filtering in bit by bit. Custom work has potential to bring in money, but it is difficult and requires more communication with customers and is easy to misquote things or underestimate how long it will take. It’s more interesting and fun to make custom weird bike parts than it is to sit in that room and cut wires for espresso machines all day. But we know that makes money so we’ve got to juggle maintaining those kinds of jobs with the other ones. Like what you read on The Bicycle Story? Support the work with a donation, by buying a shirt, or by sharing it with your friends. 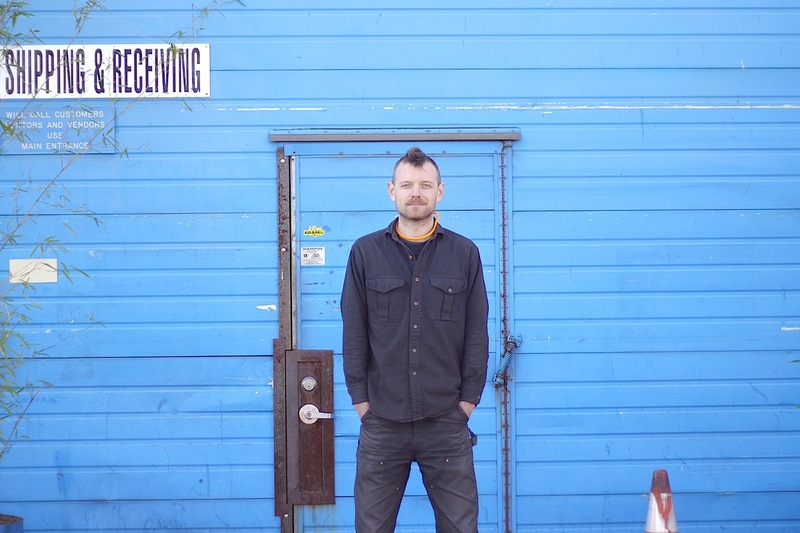 This entry was posted in Bike Industry, Frame Builders, Interviews and tagged cargo bikes, colin stevens, custom frame builders, cyclefabllc, family biking, freak bikes, haulin colin, seattle frame builder, washington frame builder. Bookmark the permalink. I’m really happy that this shop exists, especially now that Elliot Bay cycles is no longer open. I had them add some eyelets to the seatstay/chainstay bridges of my commuter bike so that I could properly install some nice Berthoud fenders on my commuter bike. It was quick, inexpensive, and the best money I’ve spent on that bike. In this interview, Colin states that his shop isn’t able to do computer-controlled production, but that has changed. I was just visiting 2 mos ago and, with mouth agape, watched their new massive enclosed CNC milling machine cut some fancy aluminum parts.